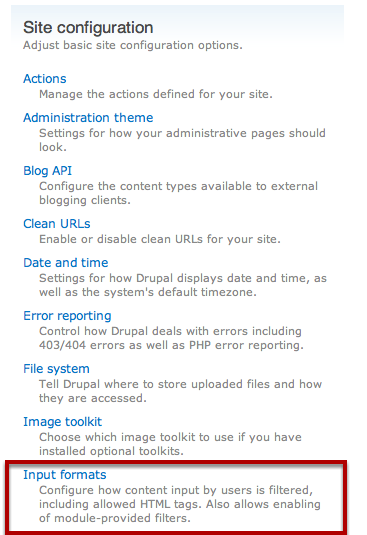 If you will be posting lots of ScreenSteps content to Drupal you may want to consider changing the default Input Format to Full HTML rather than Filtered HTML. The default input format, Filtered HTML, will not show lesson images. You can also change the input format on a per-lesson basis if you don't want to change the setting globally. 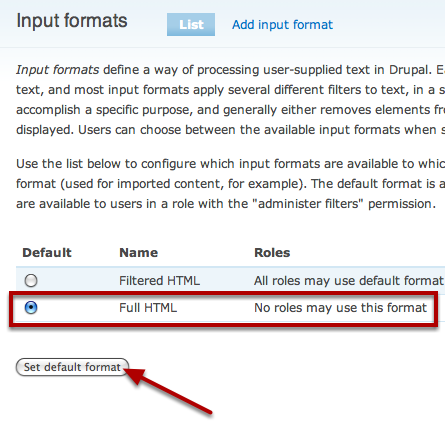 From the main administration menu you will find Input formats under the Site configuration section. Click on it to load the configuration screen. Change the default input format to Full HTML and click the Set default format button.